​​Real Madrid skipper Sergio Ramos is without doubt one of the best goalscoring defenders in the history of the sport, with the Spaniard’s record in front of goal even better than a host of strikers this season. The defender has been entrusted with spot-kick duties at Madrid post the departure of Cristiano Ronaldo to Juventus, and statistics show that his record from the penalty spot this season is even better than Ronaldo and Lionel Messi. The 32-year-old scored the third goal against rivals Atletico Madrid from the spot during their 3-1 win in the La Liga on Saturday to take his tally to 11 for the season. Out of those 11, eight have come from the spot, with a conversion rate of 100 percent, which is better than both the footballing legends. 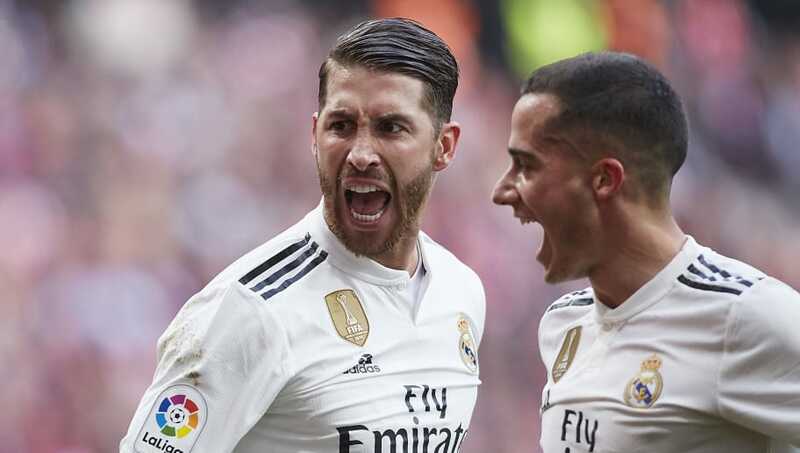 Atletico are Ramos’ favoured opponents in the La Liga, with the defender netting six goals against them, with the Spaniard only scoring more against Sevilla in his career in the league. In total, he has 84 goals to his name for the Los Blancos, with Ramos coming up with some important goals during his career. Ramos and Madrid will next be seen in action on Wednesday, the 13th of February when they face Ajax in the first leg of the round of 16 fixture of the UEFA Champions League.